Hi everyone, welcome back to my personal blog! This time, I want to share a bit of my travelling route in Hokkaido. Earlier last month, my friends and I decided to have a week trip to Hokkaido. 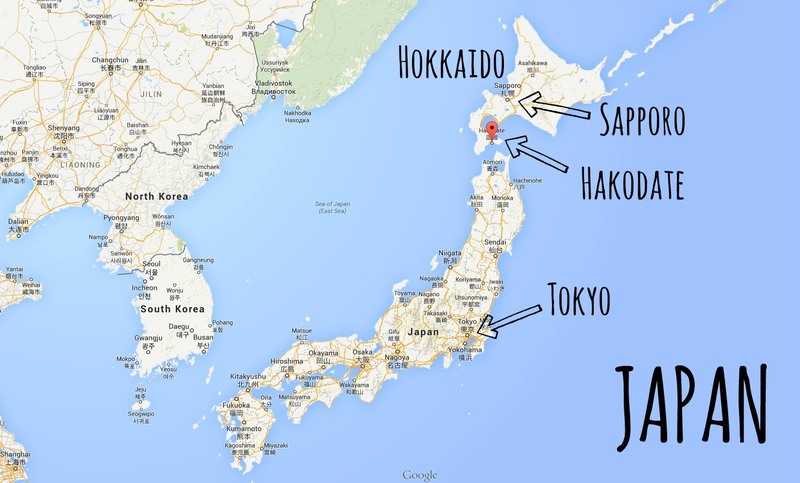 If you don't know where it is, Hokkaido is located at the northernmost part of Japan. So, why did we choose Hokkaido, especially in winter where every single corner of Hokkaido is famous for its bear-killing temperature? Well, winter is pretty awesome, especially for people who lives near the equator because there's no snow there. In addition, Hokkaido has a very well-known snow festival (雪まつり) which is held for 1 week every February in Sapporo, Otaru, and many other places. The journey started from Tokyo and we took a 1-hour flight from Haneda to Shin-Chitose airport. It took another 1 hour to go from the airport to the central part of Sapporo. The snow festival event is held in Odori Park, where you could see a lot of people falling down because of slippery snow various sculptures made of snow and various food stalls along the road. 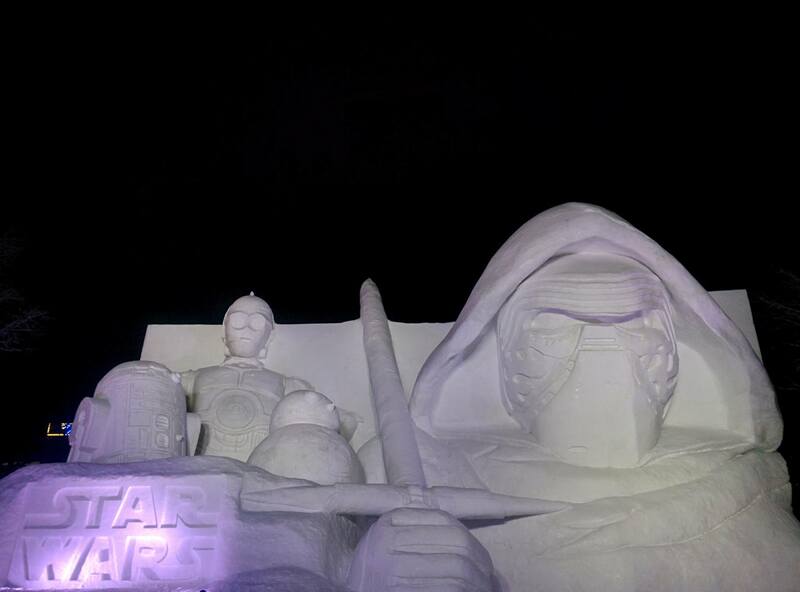 A lot of interesting sculptures were showcased, such as Star Wars, Final Fantasy VII, Pokemon, PPAP, and many others. 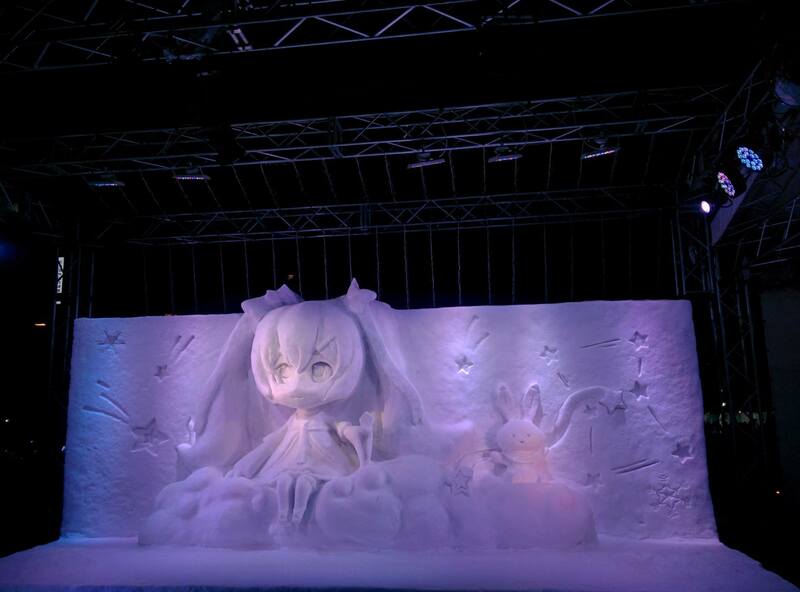 The main mascot of this event is snow Miku. Unfortunately, we went there on the sixth day and almost all of the snow Miku goods have been sold out. Nevertheless, we still could enjoy the cute sculpture of Miku! The only recorded tragedy on our first day was a pair of broken shoes. It's indeed a miracle that one of my friend could finish this trip with "supposed-to-be-waterproof" shoes in Hokkaido. Lesson learned: Make sure that your shoes, or rather, boots are indeed waterproof. . . . Wait, there's also another half-categorized tragedy where we should walk 2 km from the nearest station to our Airbnb house in the freezing winter. By the end of our stay, some of us have become a professional in differentiating snow quality as snow quality really determines one's walking speed. On the second day, as someone who loves historical lesson in class, we started our journey with a museum visit. This museum is known as the oldest museum of its kind in Japan. 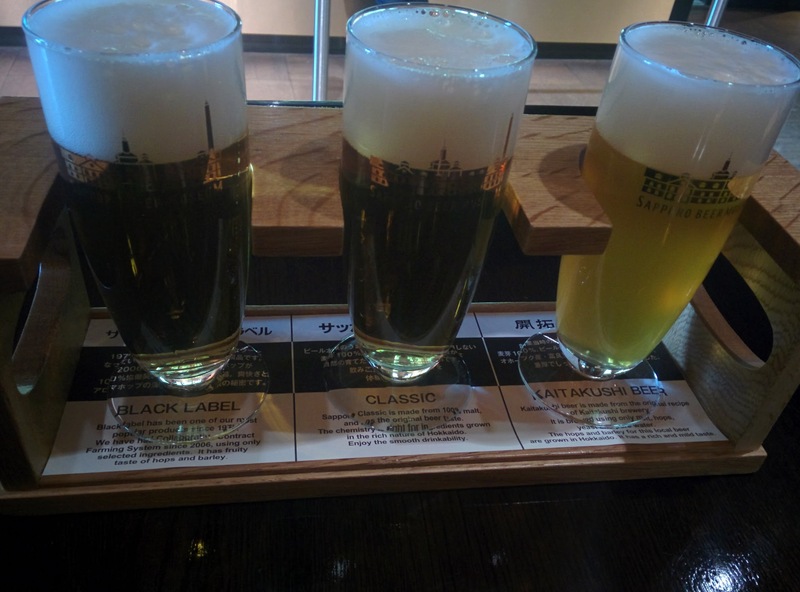 Ahem, so we actually visited Sapporo Bear Beer Museum. In Sapporo Beer Museum, you could either pay small sum of money to be accompanied by a guide person or enjoy the museum by yourself for free. Since we strongly believed that practice is better than theory, we ordered a set of beer for tasting instead of paying for a guide person. We really love historical lesson and our journey didn't end there. We took a 1 hour and half train to Yoichi. 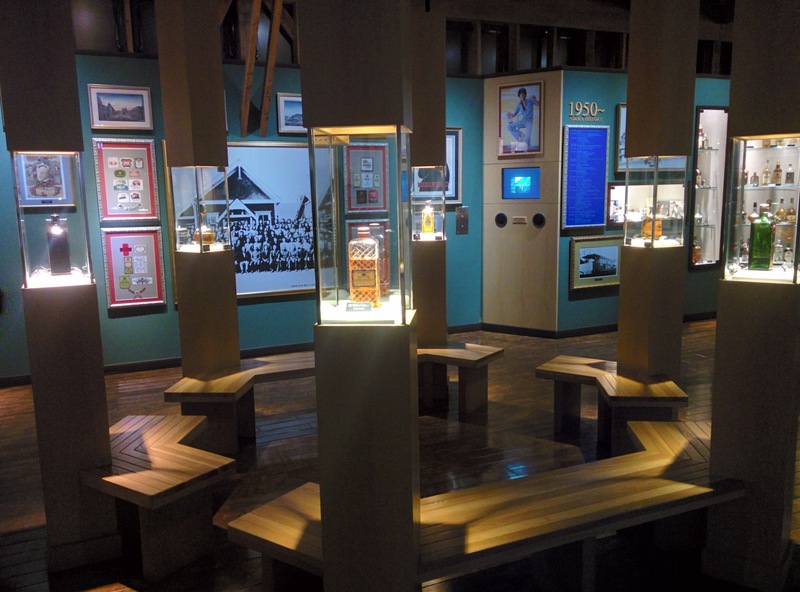 Yoichi is quite famous for its whisky distillery, known as "Nikka Whisky Yoichi Distillery". The good thing is you could get free whisky tasting here, but visitors usually buy some of those products afterwards, so it's probably not free after all. At this point, we were satisfied enough with our daily historical lesson and we traced our journey back to Otaru (Otaru is located between Yoichi and Sapporo). Otaru Snow Light Path Festival (小樽雪あかりの路) is usually held on the same schedule with Sapporo Snow Festival, and unfortunately, we went there on the last day of the festival, so some of the sculptures were already in a bad condition due to people, weather, etc. The festival is divided into 2 different locations: the Unga Kaijo area and the Temiyasen Kaijo area. On the last day of our stay in Sapporo, we started the day by visiting Hitsujigaoka Observation Hill. The panoramic view of Sapporo and the popular quote "Boys, be ambitious!" are two of the main attraction points from this place. This statue is so famous that you could find a lot of products, e.g. : Pikachu x "Boys, be ambitious!" plushies in Pokemon Center Sapporo, which are using this quotes around the town. Our next destination was Shiroi Koibito (literal translation: white lovers) Park. Before you thought that it's a perfect park for a date, Shiroi Koibito is actually a Japanese confectionery maker. Shiroi Koibito cookies are exceptionally popular as souvenir materials, so it's a perfect place to grab several boxes of souvenirs and you could also apply for tax exemption here. Initially, we had a plan to visit Mount Moiwa; yet, the weather was quite bad so we decided to call off our plan. The online guide recommended us to check the live camera in Mount Moiwa before going there, since it's hard to enjoy the view if the weather is bad. Finally, we decided to take a stroll around Odori - Sapporo - Susukino and visited the "usual stuffs" (read: Pokemon Center, Animate, and so on) in this town. The only problem was those shops closed too early here if you compared it to the Tokyo branch. Noboribetsu is located 110 km southeast of Sapporo, which took around 75 minutes by using Limited Express Hokuto from Sapporo station. It is known as Hokkaido's most famous hot spring (onsen) resort. Unfortunately in winter, a number of roads are closed because of heavy snow, so there's not much things to do except enjoying Japanese onsen & ryokan lifestyle. Nevertheless, when we went there, Jigokudani (literal translation: valley of the hell) was still available as public attractions. It's a perfect place to dispose unwanted things from your life, I mean, stressful thoughts and stuffs. We had a night stay at Kashoutei Hanaya and the experience was wonderful since we could enjoy Japanese atmosphere to the fullest here. Their service is also exceptionally good, such as a ride to Jigokudani from the hotel for free, warmth welcome service, etc. After we had a good rest in Noboribetsu, we continued our trip to Lake Toya (50 km west of Noboribetsu). The lake shape is pretty much similar to Lake Toba in North Sumatra, with an island in the middle of the lake. The name itself only has one character difference ("y" vs "b"), so probably they have a teleport service between both lakes! Lake Toya never freezes even in the depth of winter and they provide an hourly ferry service to take a look around the lake (1400 yen for 30 minutes). Characters from Sora no Method! We arrived at the hardest part of our travelling section: Lake Toya to Niseko. The easiest route that we found: Lake Toya (L.E. 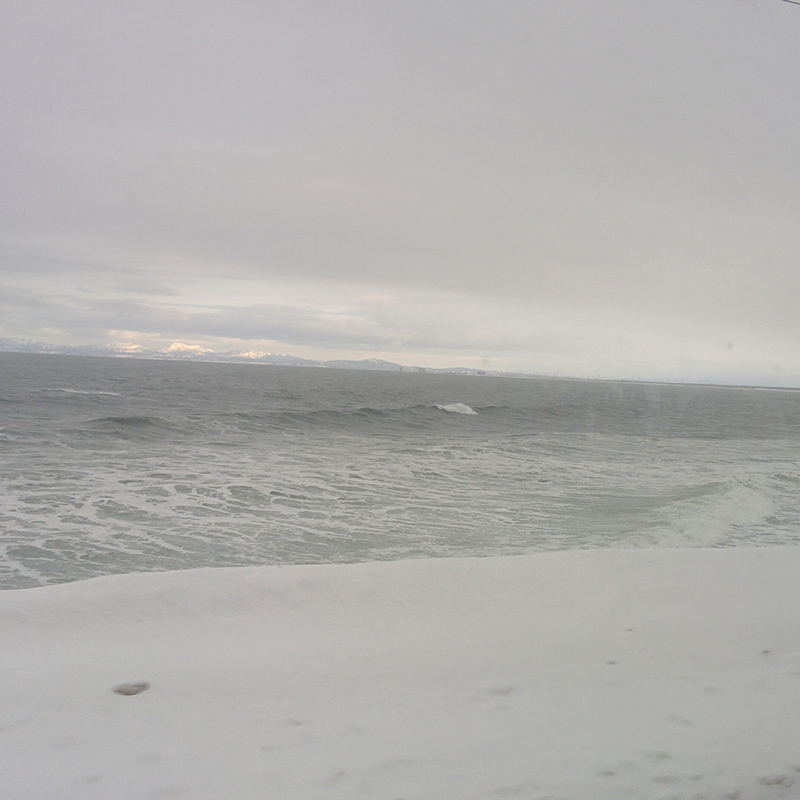 Hokuto) --> Oshamambe (JR Hakodate) --> Niseko. There're only 4 JR Hakodate trains per day to go to Niseko from Oshamambe. In total, it took 3 hours for 100 km distance between Lake Toya and Niseko. A taxi fee between Niseko station and our hotel (Grand Niseko Hotel) was a whopping 4000 yen (~US$ 40) for 8 km distance! The next day was fully dedicated for ski! Niseko is a prominent place to international skiers and snowboarders for its snow powder quality. Even if you don't speak Japanese, Niseko provides one of the best English support compared to most parts of Japan. Niseko is divided into 4 resorts: Hanazono, Grand Hirafu, Niseko Village, and Annunpuri. Since all of us were a beginner, we didn't understand how ski / snowboarding actually works and we cleverly climbed the mountain without taking the gondola or ski lift. We successfully fell and got thrown several meters, fortunately, no one became a giant snowball. At the end of the day, no one died, which was a huge success parameter for us. 10/10 will ski and fall down again. Hakodate, 180 km to the south from Niseko, is renowned for being one of the "Three Major Night Views in Japan". From Niseko, we reserved a Chuo bus from Niseko station, which bounds to Hakodate station. The bus only operates once per day during winter period (Dec 21st - March 20th). For some unknown reasons, Lucky Pierrot is surprisingly popular among my friends. Lucky Pierrot is absolutely not a bird gambling store; it's a local burger chain store. It's something like a trip to Hakodate would not complete without a visit to Lucky Pierrot. The number of Lucky Pierrot stores in Hakodate probably exceeds the number of McDonald's stores here. Hakodate has a lot of slopes and churches, especially around the Motomachi district. I'm not good with history on why there're a lot of western-style buildings around there, but the view is great! The famous western-style street, Hachiman-zaka! And finally, we took a ropeway for Mount Hakodate. As 5 p.m. got closer, a lot of tourists, especially Chinese tourists (it's like 95% of the tourist proportion), made the observatory fully occupied. I've received a suggestion to use taxi at night-time instead of taking a ropeway in order to avoid crowds, but unfortunately, the main road was closed because of snow. Regardless of the crowds, the scenery was absolutely stunning! Breathtaking view from Mount Hakodate! Seven days has passed instantly and it's almost time to face reality back. We started our day from a morning market near the station. Hakodate is also famous for its seafood quality and there's a saying: "Hakodate is full of crabs, crab is life, thus Hakodate is life". Afterwards, we visited a star-shaped fort, known as Goryokaku Fort. Hokkaido can be considered as one of the most interesting places to visit during winter in Japan. If you are also planning to visit Sapporo during its snow festival, I particularly recommend you to make reservation 6 months before February comes. Still, you might not get any good price deal, but at least, there are more options available because accommodation gets fully booked in the blink of an eye. That's all for now, see you next time!